Edited by Alastor_N, 22 July 2018 - 06:18 PM. Or the Panther 8.8 being an awesome sniper. i am still getting cursed at for telling a clanmate to buy the CDC. Time to make it 2 for 2. Edited by Clerin, 22 July 2018 - 06:19 PM. Moved to off topic ? Maybe it's time for a new sub forum dedicated to WG mistakes. It could be ignored just like the bug report forum. Maybe. Why don’t you put it in the Suggestions sub-forum? You'll have to sort out that sense of humour if you want to become a full mod. I had it fixed. Thank you. 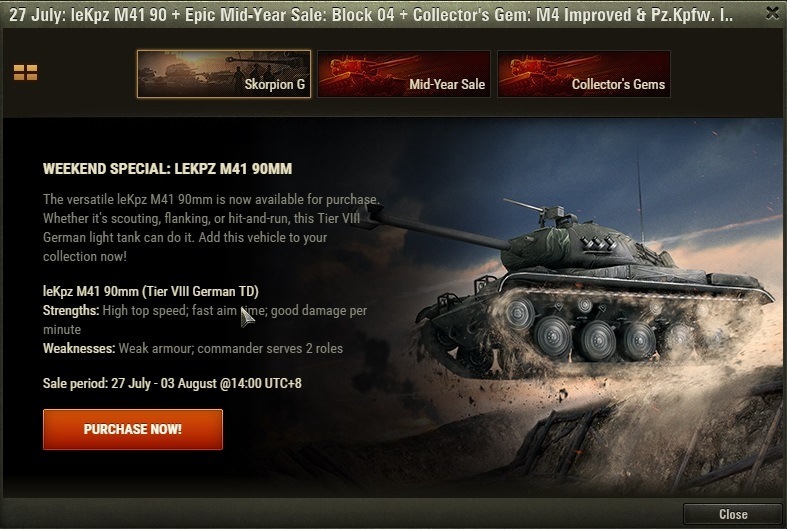 Just had an in-game popup (didn't take a screenshot) which advertised th leKpz M41 90mm as a Tier VIII German TD. This thread should be pinned lol. actually starting to be concerned about the health of the guys in charge of the sale. did they have chicken rice yet for lunch or not? 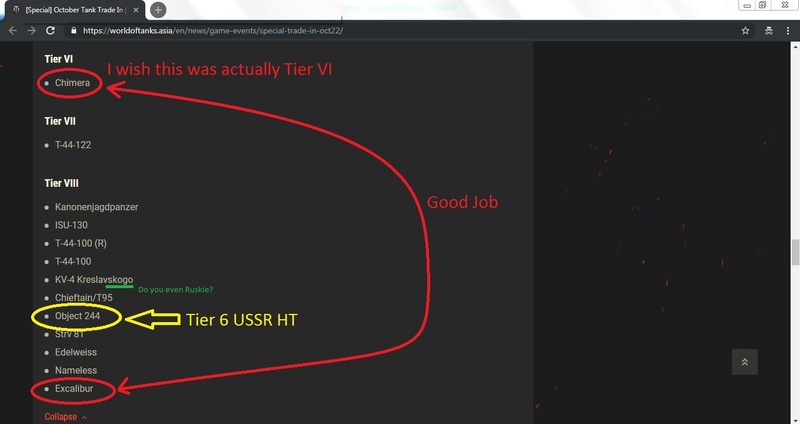 I see WG are playing it safe this time. 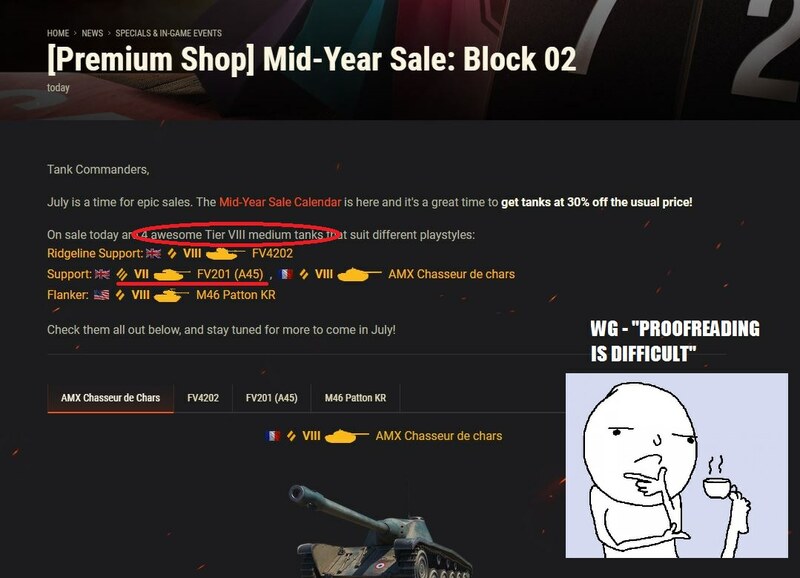 No mention of numbers, no mention of tank type, just "premium tanks are going on sale", and that's it. And 30% off of buying that T29. Schweeet! I had a feeling it would be best to wait a few days. Edit: I'm not even going to try to highlight the errors on the list that can be traded in. It's going to take too much effort for the little upboats. Anyone noticed that the current equipment sale says "consumables sale"? Yep, I even went to check on consumables. WOT Asia / Australasia Language Based Communities → English Speaking Community → News and Announcements → CCs and WeeGees on Frontline ANZ! WOT Asia / Australasia Language Based Communities → English Speaking Community → World of Tanks Game Related Discussions → Defender is on sale! WOT Asia / Australasia Language Based Communities → English Speaking Community → World of Tanks Game Related Discussions → Space Cadet Training Academy; World of Wut?